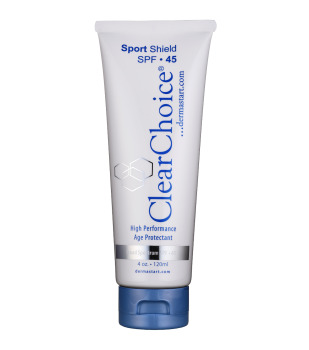 ClearChoice Professional Sport Shield-SPF 45, 4 oz is a powerful combination block and light moisturizer formulated with replenishing vitamins and antioxidants. Hyaluronic Acid: Natural humectant (Retains 1000x of its weight in water). Use at the end of a treatment to moisture and protect the skin. Active Ingredients: 12% Micronized Zinc. Inactive Ingredients: Certified Organic Aloe Vera, Thioctic Acid (Alpha Lipoic Acid), Magnesium Ascorbyl Phosphate (Vitamin C), Panthenol (Vitamin B5), Dexpanthenol (Vitamin B12), Tocopheryl Acetate (Vitamin E), Ergocalciferol (Vitamin D), Vitis Vinifera (Grape) Seed Extract, Oenothera Biennis (Evening Primrose) Oil, Helianthus Annuus (Sunflower) Seed Oil, Carthamus Tinctorius (Safflower) Seed Oil, Ulmus Fulva Bark (Slippery Elm) Extract, Borago Officinalis (Borage Oil) Seed, Alpha Bisabolol (Chamomile), Plantago Major (Plantain), Allantoin, Hyaluronic Acid, and Olive Squalane.